The word finance shares its root, the Latin word finis meaning “boundary” or “end,” with many other terminal words. In fact, the mere mention of the word “finance” to many people causes an abrupt end to conversations. As much as we like to harp on the old maxim that “money isn’t everything,” we often must grapple with the constraints its lack of bountifulness in our lives places on our mind, body, and spirit. Etymologists and linguists would have to agree. Limitations are literally in finance’s DNA. In modern English, finance was first used as a noun in 1739. The noun denotes all the various ways people manage money: as individuals, as businesses, and as institutions. The formal terms for these divisions are personal finance, corporate finance, and public finance. Finance was first used as a verb in 1866 to describe the method of obtaining other people’s money to pay for items forthwith, creating simultaneously future obligations to repay the sums obtained, plus interest. As America recovered from its disastrous Civil War, the concept of borrowing now to pay back later became a necessary part of Reconstruction. America’s Civil War debt took almost 35 years to get under control, and by the time it was… along came another war. Reconstruction, in fact the Civil War itself, was financed. The World Wars, and the Keynesian policies of the Great Depression in between them, were financed. In the post-war boom, American citizens began to finance purchases of homes and cars, beginning an exponential trend that would not relent until the Great Recession. It was quite a century for the newly fashioned verb. The Greatest Generation began to finance their lifestyle in the early 1950s. Household debt gradually increased until its first inflection point after the 1981-82 recession. Its second inflection point came during the dot-com bubble, after which household debt doubled in less than a decade. 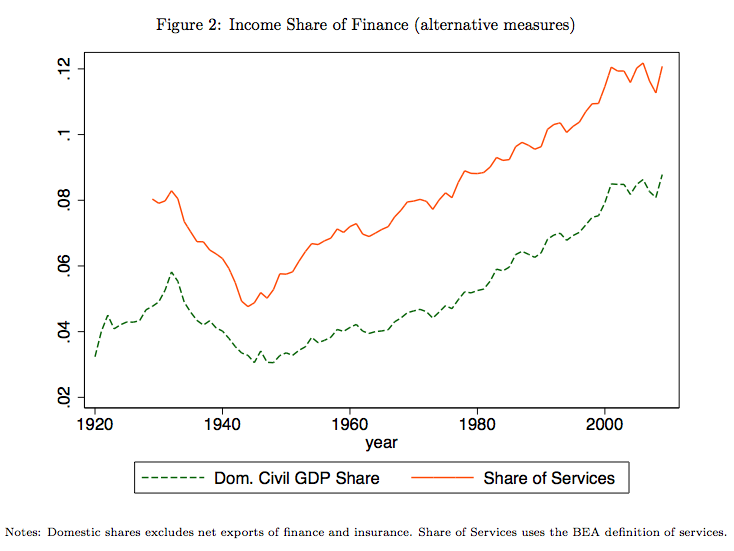 100 years after the homonymic development of the verb finance, both governments and individuals were free to finance their finances. Anything you could buy could be financed. And finance professionals helped arrange your finances with finance products that you could finance. A pyramid scheme? Perhaps. Needless to say, the finance industry has experienced nearly uninterrupted growth since the end of World War 2. Today, approximately 8% of the income earned in the United States comes from the finance industry. Eight percent. As shown in this chart from a 2011 New York Fed report, the US finance industry, in tandem with the advent of the compound noun “portfolio investment,” has inexorably grown into a trillion-dollar-plus industry. Hence, although the finance industry should at least be subconsciously aware of the limitations inherent in the very nature of the word that defines their occupation, they still have yet to find its boundary or end. If you are not a financial intermediary, the Latin root of the word finance hits a little closer to home. Borrowing today to finance today’s finances is a habit of personal finance that can only last for so long. Eventually, the carousel stops spinning for common folk. 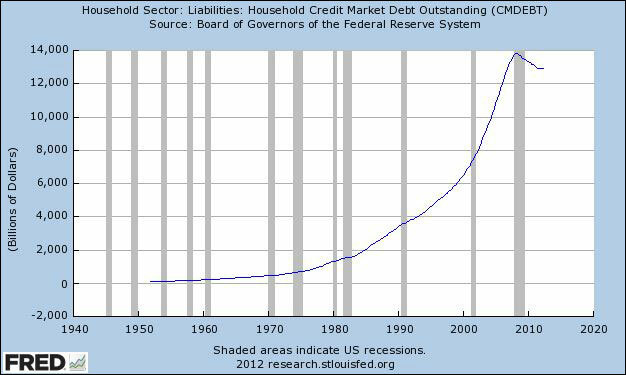 We are not Too Big To Fail and there is no Fed discount window for us to borrow from. Currently, qualified institutions can borrow at a 0.15% interest rate. Institutions with literally hundreds of billions of dollars in cash sitting on their balance sheet. Zero point fifteen percent! Unlike corporate finance, the realm of personal finance is largely unchanged from the 15th century, when the French coined the term mortgage by combining the terms for death and pledge. More than 500 years later, the finance industry nearly destroyed us all with their own “death pledge” wizardry. In return, the US government allows these same institutions to borrow at an absurdly low rate. 0.15%! Meanwhile, most people do not even qualify for a mortgage. But I digress… this invective is a story for another post. Although financial study lies at the confluence of economics, accounting, and math, the word finance itself intimates a dual perspective on limits. On the one hand, institutions and corporations use finance to stretch those limits to the utmost. On the other, individuals increasingly finance themselves into financial straitjackets that severely limit their personal freedom.